So much to learn when you’re living in London and part of your adventure will be to get out of your cozy London apartment and explore the city of London while learning as much as you can about the fascinating history of London and England. The Old Lady of Threadneedle Street was born during the war, one of the many wars, between England and France. In 1694, King William III, went down to his counting house and discovered that he was running a little low on gold bars. With the war effort gobbling up so much money, and knowing that his cash card would be refused at the ATM, he approached two gentlemen, who agreed to lend the King some cash. As you all know, even if you’re not a King, if you take out a loan, you will have to pay it back along with interest. The loan agreement with William was to be paid back by taxing the public on the alcohol they consumed as well as a shipping tax on businesses. The original interest rate was to be 8% which would be paid back, in effect, by the British people. Out of this financial transaction, The Old Lady of Threadneedle Street was born. The transaction was the foundation for the Bank of England, and the moniker ‘The Old Lady of Threadneedle Street was given to the bank after a 1797 political cartoon by James Gilray which showed the Bank of England as a woman sitting on a chest of money. 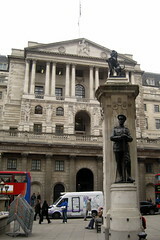 The Bank of England was the first private bank in the world and is still located on Threadneedle Street today. While the imposing facade is definitely worth a look when you are living in London, it is well known that there is more of the Bank of England underground than at street level. Since 1973, the bank has employed a highly trained private security force, but until then it was guarded by the Brigade of Guards. Ever heard the expression, “It’s as safe as the Bank of England”? It refers to the absolute security of the bank throughout the years it has been in existence. If you’re interested in money and the history of banking then you should visit the Bank of England Museum which is open on weekdays and offers a unique insight into the history of the bank as well as the history of money and especially the history of bank notes. The bank of England has always been the bank of the government of England and it is the lifeblood and the heart of the English banking system which has played such an important role in world banking. My question still stands through…who was ‘the old lady of Threadneedle Street’?